The arena renovates both the fan and student-athlete experiences with new premium seating destinations and athletic facilities. In an age of multi-billion-dollar, publicly-funded facilities, Cintas Center stands as shining testament to on-campus, privately-funded arenas. Built in 2000 for approximately $46 million, Cintas Center, on the campus of Xavier University in Cincinnati, Ohio, is a 10,250-seat, multi-purpose arena and home to the NCAA’s Xavier Musketeers men’s and women’s basketball and volleyball programs. The arena, built through private donations as part of the university’s “Century Campaign”, opened to rave reviews for its design and functionality. With just over 4,000 students in enrollment at the university, Cintas Center was a major step in transforming Xavier from a mid-major college basketball program to one competing with the upper echelon of collegiate sports, while enhancing the student-athlete experience in the competitive recruiting landscape. Fast forward to 2017, when the Xavier University administration enacted a strategic plan for Xavier Athletics named “Magis” (a Latin word meaning “doing more” or “doing better”) and a $30-plus million capital improvement campaign, focusing on Cintas Center upgrades and enhancements to the 18-year-old facility. Phase one of the campaign was recently completed for $5 million. Fan experience enhancements abound, from 530 gallons of blue paint covering previously exposed concrete areas, to new energy-efficient LED lighting that creates a stage-like atmosphere by illuminating the court while darkening the seats, to a variety of new premium experiences for all patrons. In the ever-growing need to recruit the highest level of student-athletes, state-of-the-art training rooms and weight rooms are paramount. Cintas Center's renovations include new strength and conditioning elements, which allow the student-athlete to train and perform at the highest level. As part of an ongoing capital improvement campaign, $5 million was invested across multiple areas of Cintas Center in 2017. Through the vision of its architectural partner, Cincinnati-based MSA Architects, Xavier developed the Cintas Center upgrades, which transform the facility from one keeping pace, to one setting the pace in the collegiate sports marketplace. Fans and student-athletes will see significant changes at the start of the 2017-2018 NCAA basketball campaigns that enhance the ultimate gameday experience. A refurbished Joseph Club opens up the space for socialization and provides new four-seat loge boxes, referred to as "living room seats" by the university. Frontline Court Seats – The first seven rows of the baseline (formerly 18-inch seats) were replaced with 24-inch, luxury-padded seats with exclusive access to the renovated Joseph Club bar and lounge. Courtside Club – The most exclusive hospitality area presents courtside seat holders with an up-close-and-personal experience with the players before tip-off. Food and beverage is included, along with in-seat service during the game. Joseph Club Living Room Seats–The ideal “living room” entertainment experience, these loge seats give fans all the comforts of home through four-seat pods with individual TV screens to view all the action and replays. In-seat service is provided in this all-inclusive area. The Lookout Seats – This new addition provides exciting views of the court, cantilevered above the raucous student section. A new LED ribbon board from ANC has been installed along the face of the new seating section, measuring 142 feet by five feet, and completing the 360-degree LED fascia within the arena bowl. The Lookout includes access to the new 2,696 Zone hospitality area, named for all-time leading scorer Byron Larkin. 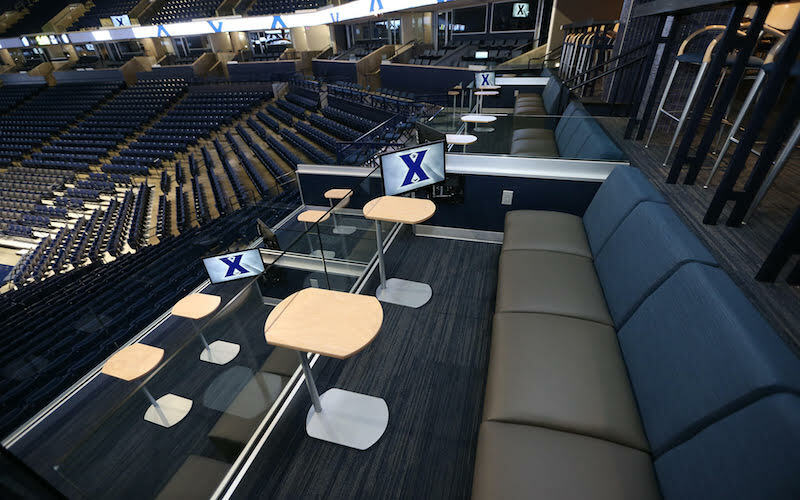 Traditions Club – On gamedays, this second-floor academic area is transformed into a sports bar destination with televisions showing NCAA games, food and beverage stations, and pregame radio shows from the Xavier announcers. Tech Deck – This exciting new suite setting for groups up to 40 guests utilizes virtual reality technology, putting fans right on the floor in the action of the game going on at the time. Believed to be the first-of-its-kind in the collegiate arena environment, three virtual reality stations give fans the chance to watch the game in a 360-degree immersive environment, as if they were standing at midcourt. The Woods – A nostalgic tribute to Xavier alumni from days gone by, the university built-out a new bar area in the upper deck with the look and feel of a former local neighborhood tavern. When the university expanded its geographical footprint in the 2000’s, many local homes and establishments were razed in the process. Among those buildings was the Norwood Café (affectionately known to Xavier students frequenting the establishment as “The Woods”). 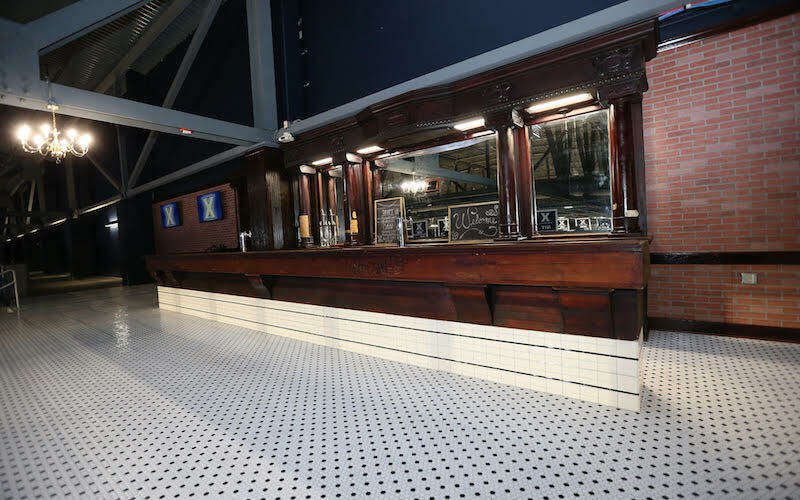 The 100-year-old cherry back bar was saved in the process, and has gained new life among the Cintas Center renovations, sitting front and center in the upper deck. The bar, complete with initials etched into the wood from its previous life, and signage that remains the same as when the structure was torn down is a tribute to the neighborhood theme and alumni base that preceded the current venue. Strength and Conditioning Room – A new 5,000-square-foot addition, the space sets the bar in terms of college basketball strength facilities. The primary weight room for Xavier Basketball features 20-foot ceilings, large exterior windows, and a state-of-the-art sound system to go with designated spaces for sprint, cardio, and strength training. New Athletic Training Room – This 5,550-square-foot space doubles the size of the previous training room and includes a new hydrotherapy suite, complete with two HydroWorx pools, anti-gravity treadmills, and Cybex equipment. New Crawford Student-Athlete Academic Center– A new study space enhances the student-athlete experience. Already an intimidating venue for opposing teams (Cintas Center was voted the third “Toughest Place to Play” in a poll conducted by EA Sports in 2009), the Cintas Center upgrades present an even stronger home-court advantage for a Musketeers men’s basketball program that sports an 87-percent winning record since the building opened. The initial response to the new environment at Cintas Center has been encouraging. Xavier University men's basketball has passed the 8,000-mark for season tickets for the first time in 14 years and sold out the lower level for the first time since the arena’s inaugural season. “There is incredible excitement about the upcoming season for the team and the many seating and hospitality upgrades at Cintas Center,” says Brian Hicks, Associate Athletic Director for External Relations at Xavier University. Xavier anticipates a continual program of updates to Cintas Center over the foreseeable future.